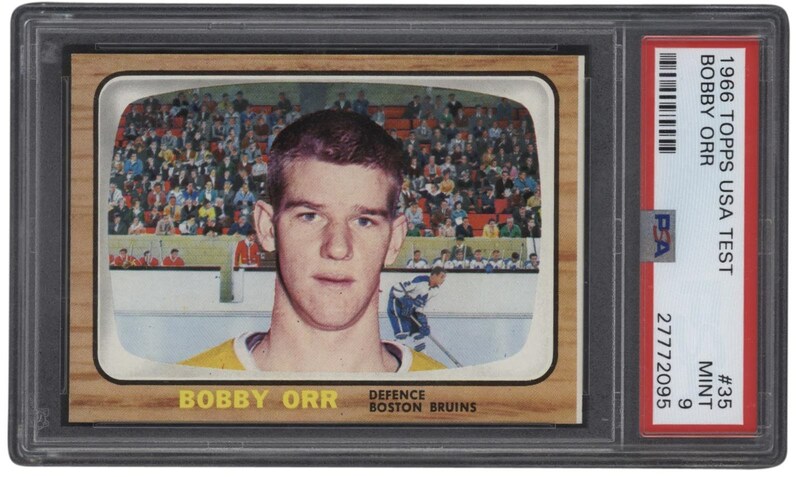 The 1966 USA Test Bobby Orr #35 PSA Mint 9 Population 1 of 1 rookie card is quite likely the MOST SOUGHT-AFTER hockey card in existence. A prodigy of the hockey world at merely 14-years-old, Orr made his NHL debut at only 18 and promptly revolutionized the defense position. His stick-handling, skating, passing and shooting made him the focal point of the offense, even though he was a back-liner. Whereas defensemen pre-Orr would launch occasional forays up ice to attack the opponent's net, Orr was perhaps the greatest INNOVATOR in NHL history, as time-after-time he would skate up ice into what previously was foreign territory for a defenseman, changing hockey forever. Orr's original style paid great dividends as he led the Bruins to two Stanley Cups and scored over 100 points in six consecutive seasons (1969-70 through 1974-75) averaging an astounding 35.7 goals a season in that period. The NHL expanded from six to twelve teams for the 1967-68 season. Because of this, to test American interest in hockey, Topps released a "TEST" extremely limited issue of its 1966-67 hockey cards to the California market. They are EXTREMELY SCARCE. 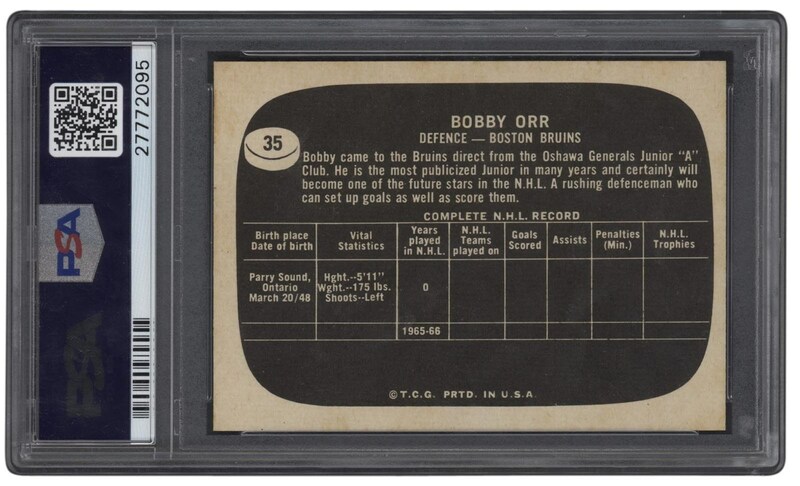 The Bobby Orr #35 card from this TEST set is the APEX of the set and possibly of ALL-TIME.